Bonus: Half-Life Pack – Available now through the Workshop for all FINAL FANTASY XV WINDOWS EDITION owners on Steam! Half-Life Costume (Main Game Exclusive) - Protective gear made at the Black Mesa Research Facility. Crowbar (Main Game Exclusive) - Metallic tool that could prove quite useful in a pinch. HEV Suit (COMRADES Exclusive)- Full outfit for the entire body, exclusive to COMRADES. Protective suit made at the Black Mesa Research Facility. Scientist Glasses (COMRADES Exclusive)- Decorative accessory for the face, exclusive to COMRADES. Thick-rimmed black glasses that exude an air of quiet intelligence. After a lengthy period of console exclusivity, Final Fantasy XV is bringing the boys back to town (town being your PC) on March 6. We hope you are ready for some male bonding. Final Fantasy XV is a story about male friendship, of sacrifices humans make for each other, of the occasional need for someone to prop us up, to lead us when we can not see - especially in a world where 50-foot-tall monsters roam the wilderness and an invading army can attack at any time. You know, the usual. Final Fantasy XV’s story follows Prince Noctis and his friends - a bodyguard, a political advisor, and his childhood playmate. The four good boys are travelling to marry off Noctis to his childhood sweetheart in a political union, to secure peace for the region. Of course, things do not go to plan. Your car breaks down, the wedding gets called off, and the enemy attacks your homeland. It is tough being a Final Fantasy protagonist, but at least you have a sword that lets you teleport short distances and cut down creatures the size of a house. Swings and roundabouts. Final Fantasy XV takes a lot of inspiration from Western RPGs, allowing you to travel across its open-world by car, the wind blowing your anime hair like you are the star in a Loreal advert. The camera is pulled in close. Combat happens in real-time as you slash, slice, stab, and teleport around each battlefield. Remember how agile and impressive Final Fantasy characters used to be in the older game’s cutscenes? Well, this time, you are in control of all that. That sense of awe also extends to your magical abilities: fireballs scorch the earth; ice leaves everything frosted, glistening, and slick; while summons are screen-filling showcases of power that will leave your jaw hanging. On PC, all of this will be even more impressive, thanks to a range of graphical improvements, higher resolutions, more frames, improved draw distances, better effects, and more. Not only that, but the PC version comes packaged with a host of free updates released since its console launch, as well as all the DLC released so far. That means you will be able to explore in the all-new first-person mode, you will be able to turn your car into an off-roader and tear across the countryside, and you will be able to find out more about the story as you delve into the DLC episodes, filling in the missing gaps where you allies head off on some mysterious mission. 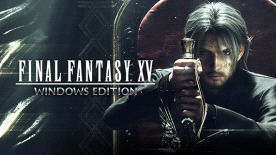 So, if you have ever wanted to play a Final Fantasy game where you feel in control all the time, in a detailed, gorgeous open world that you can drive around in a car - an RPG where your party look like 30 Seconds to Mars just got dropkicked through a Comic Con - Final Fantasy XV is the game for you. Get your chocobo at the ready, start your engines, and get out the hairspray because this is one epic journey.